Although in many cases Romanesque was gradually supplemented or replaced by actual Gothic, in some parts of the country a new style emerged with elements of both styles. Romano-Gothic has become the name for this style, which itself showed several variants. The late-Romanesque style of the Rhineland has often been called Romano-Gothic as well. For the Netherlands however this name is mostly used for a group of churches in the northern provinces, especially Groningen, where all of the following examples can be found. Typical for this style are the walls and gables of brick that are richly decorated with recesses and patterns of bricks. An early example of this group is found in Leermens, where in ca. 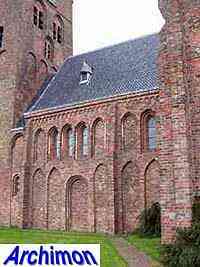 1250 a new choir was built to a Romanesque church. In this early stage of Romano-Gothicism only round-topped arches were used. In the interior the choir has a mellon-vault, a typical property of Romano-Gothic churches. 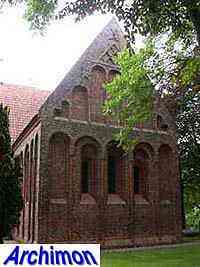 A later variant of Romano-Gothicism features pointed arches, like at this church in Stedum. Note that many arches are purely decorative; Romano-Gothicism borrowed the decorative elements of Gothicism, but not the constructional principles. 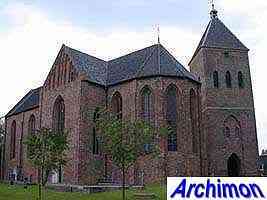 The church of Zeerijp represents the final stage of Romano-Gothicism. Basically it's already a Gothic church, but the gables are still decorated in Romano-Gothic style, while the interior still has mellon-vaults.